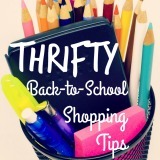 Need some real-life back to school shopping tips? Well, let me tell you about a funny thing that happened this back to school season. A reporter from ABC12 in Flint, Michigan found me via my blog. He asked me to show him and his viewers how to save money while back-to-school shopping. Now, I’m NOT a Coupon Queen Extraordinaire. I’ve even poked fun at extreme methods of saving money. That said, I do know how to save a buck–or twenty. 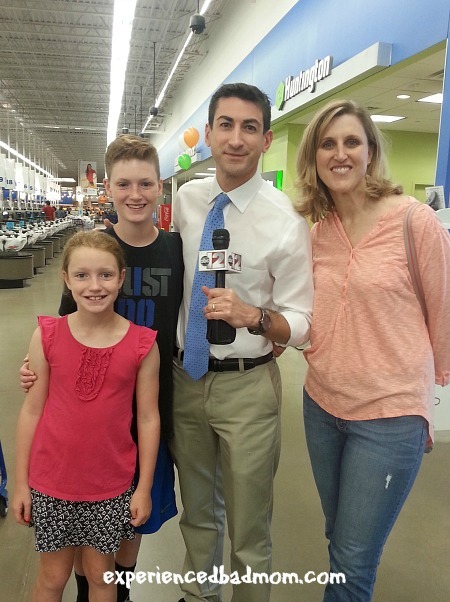 So the kids and I met up with ABC12’s Marc Jacobson and his cameraman DJ to walk through Meijer and share our money-saving tips. Shop the store’s sales flyer. This is where you will find the best deals and deepest discounts. Shop multiple stores. Don’t be afraid to visit more than one store to get the best deal. If you shop just one place, you’ll get a deal on some things, but you may pay full price for other things just because you are already in the door. Shop different types of stores: grocery store, superstores, and office supply stores. Bring a list and buy what’s on it. If you don’t bring a list, then you could start filling your cart with things your kids MAY need vs. what they DO need. Check the school’s website for a list by grade or bring the letter/email from your child’s teacher. Stock up–but only if it’s something you will use. On our shopping trip with ABC12, we found 1 subject notebooks on sale for 17 cents. 17 cents! You won’t find a better price and your kids will always need these. Buy store brand vs. name brand. My daughter needed 4 plastic folders with fasteners. The store brand was 50 cents while the Five Star brand was $1.99. Buying generic is a no-brainer in that case. The same goes for cartoon character or other licensed merchandise. A Taylor Swift notebook cost $1.99. Meanwhile, the store brand cost 17 cents. Again, it’s a no-brainer. If you can, try shopping without the kids. That way you’ll avoid the inevitable whining for something that is sparkly/hip/fringed/cool AND overpriced. Check store apps. You may find a digital coupon or a % off a purchase code that you can apply at checkout. I like the Meijer app, Cartwheel by Target, and the RetailMeNot app which shows coupons for multiple stores. Lastly, don’t shop hungry. Otherwise, all the effort you put in to getting great deals will be blown on that bag of chips and candy bar that your kids (or you!) just have to have at checkout. 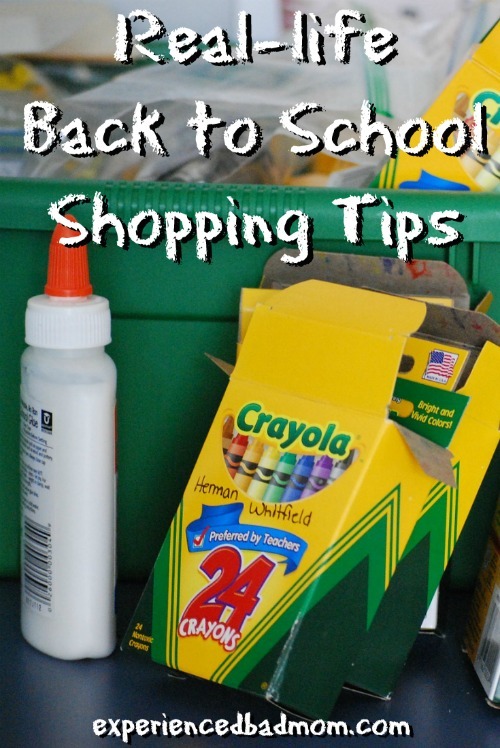 There you have it, my real-life back to school shopping tips. Truly, if I can save money by using these tips, then you can do it, too. Tell me, what other ways do you like to save money on school supplies? 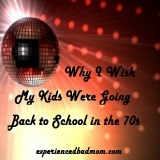 Wanna see the clip of me and my kids doing our back to school shopping? Then like my Facebook page where I’ll post the link! 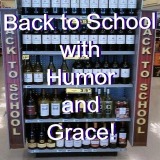 Looking for more advice about Back to School or just need a laugh? Thank you, Jen! You know, I’m not big enough to get any (hardly) sponsored posts so when this opportunity popped up I jumped at it. It was an adventure and I’m glad we did it! I triple checked, and maybe I was tired, but I swear the cartoony notebooks were the same price as the others this year. My kids think I”m a pushover and I’m just glad we got out of there without tears! To see you and your two “in real life?” Very special. And guess what? I’m detecting a weensy bit of a Canadian accent. Or maybe it’s wishful thinking. Either way, I love it. You may not be far off, Kelly. I definitely think I was channeling some weird “I’m on TV and I should fake it til I make it” voice! Which could very well be a Canadian accent. Thanks for watching. I watched with baited breath, hoping I didn’t say something off the top of my head that would get me in trouble! I bet you’re good at it too! What about those agencies that run stuff-a-backpack type drive this time of year? For instance, I saw my bank is collecting backpacks. I bet you could pack a great backpack for someone who needs one! This is SO cool that you were found via your blog. And I love your tips. I love saving money. I use coupons and apps. I also stock up when things go on clearance. But then I sometimes forget where I put everything. Oops. Thanks, Amber! As a blogger yourself, I’m sure you can relate to my pleasant surprise when I got contacted by the reporter. I was like, “ME?” And all those money saving, coupon sites were the first blogs I read back in the day, even before I started blogging. My favorite one that I still read to day is MoneySavingMom.com. Katy! Congratulations! What a score. Do you have video of it? Greta advice, too, btw. I’m guilty of over-buying. Deals! So I like to stock up my office, and then I forget I have a surplus and buy again mid-year. This is SO COOL! Congratulations on the experience! I actually just buy the box and have it mailed to the house. I know… not the best deal but I am terrible at saying no to the wants vs. the needs… I do still need to get a backpack though. These tips are great! You are FAMOUS!!! Oh how I just love that you were FOUND and had this cool experience, Katy!! I actually do EVERY ONE of your tips… 🙂 I’m totally into saving money over here! Ooo, it was fun! How neat that we put ourselves out there – and people see us! Great tips!! Any idea how to talk myself out of the hip/sparkly/fringed options because…oh I can’t help myself!!! You know, if the sparkles fit into your budget, go for ’em!